On Friday, I had one of the most amazing photography experiences I have encountered. In fact, it happened so quickly, so unexpectedly and the moment felt so surreal that even when I looked back at my photos this morning, it was hard to believe I had taken them. Somehow, I walked into a precise location at an exact moment and had the right equipment that was set up and ready to go. All of that still feels a little mind boggling to me, especially when I think about what it took to even get there. Last week, I sat down to map out our schedule for the summer. Our kids have reached a stage in life in which I no longer get to control the calendar or have a say into each day’s activities. Our two boys both started jobs as swim instructors, and when swimming lessons begin next week, they will be working five mornings a week. Andrew has a film camp this summer, and he’s also in a local theater production with practices every night for a month. Matthew plays on both a school and travel baseball team and will have practices and games seven days a week through July. Alayna made high school cheer and starts practice next week. Jayda made a competitive gymnastics team, and she will be practicing 10.5 hours a week. I looked at the calendar and realized we would have ONE day when everyone was free between now and the end of July. I asked (begged, really) if we could do something as a family. I had hoped to go to Starved Rock, but they voted for the zoo. They were all willing to spend a day with me, so I certainly wasn’t going to argue! 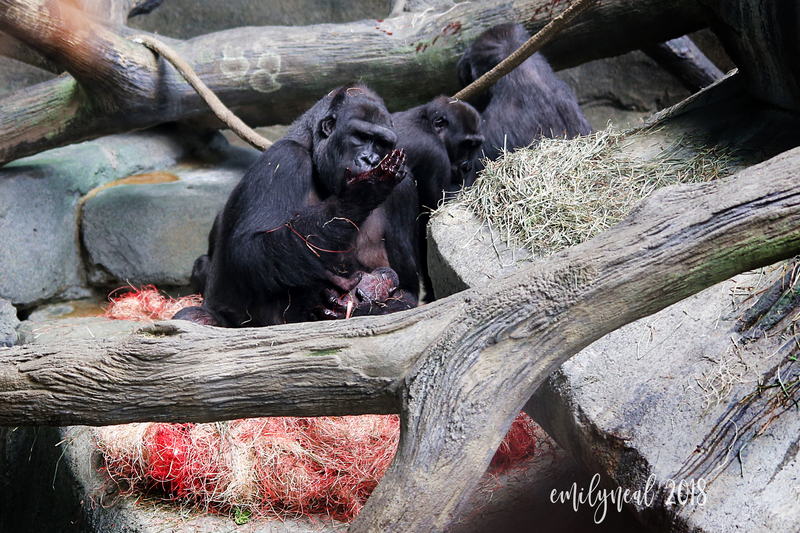 Friday morning, I purchased a membership to the Brookfield Zoo, and off we went! I can’t remember the last time we all went to the zoo together. Seeing all of the young families there reminded me of the times I pushed THREE kids packed into a double stroller while pregnant with our youngest. I was finally free to just walk along with four totally self sufficient people, and yet, I couldn’t shake the feeling I should take my camera, along with my huge 500 mm lens and monopod. That’s a lot of equipment to carry around the zoo all day, so I also took our big plastic wagon that we only use these days to carry mulch. I packed a big lunch bag, and threw it in the wagon, along with my camera gear and sunscreen. My kids were all in a great mood, and thankfully, no one complained when I got out my camera to shoot photos of the giraffes or zebras. We headed to the dolphin show, but we were a few minutes late, so we decided to make our way to see the monkeys instead. Tropic World is always one of the busiest exhibits. It’s broken into three large areas, representing three different parts of the world. I patiently waited to get a good viewing spot in the first room where I could fully extend my monopod and not hit anyone in the head with my huge camera lens. We moved on to the next room, and I told everyone to go ahead while I waited to get some good shots of the orangutans. I walked into the next area with the gorillas, and I could see my kids on the upper ramp across the room for me. 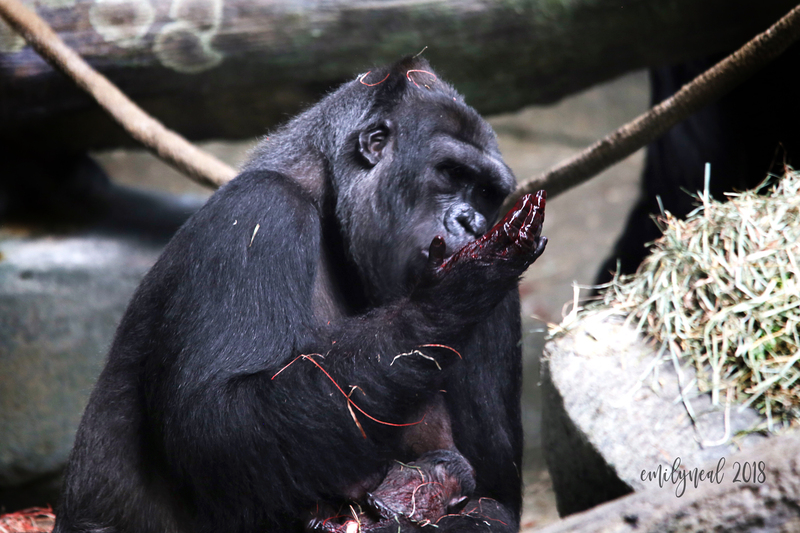 I found an open spot looking directly at the gorillas so I extended my monopod and took off my lens cap. Then, she turned to see me with my camera. “Did you get that on video?” she asked excitedly. 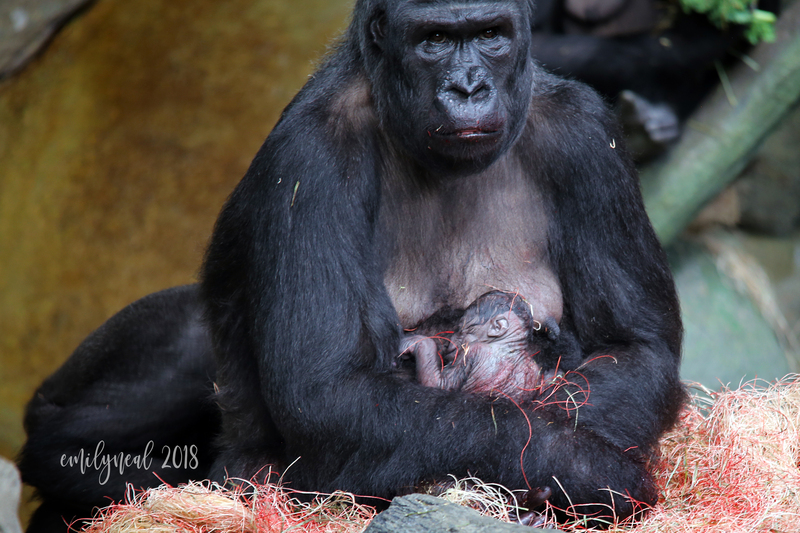 She explained that the gorilla had just finished giving birth. That long cord was the umbilical cord! 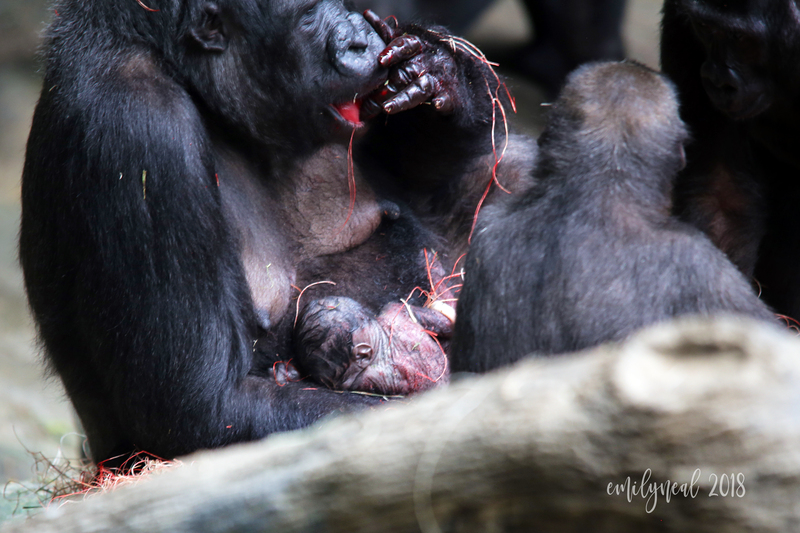 The other gorillas gathered around her, circling the mom and the newborn. Finally, they moved back and I could see the baby. I wasn’t wearing my glasses, so I could barely even see the baby with my naked eye. I couldn’t wait to look at my photos on my camera to see in sharper detail what I couldn’t see in real life. I tried to move up the ramp to get a better vantage point. That’s when I realized that two zoo workers were slowly making their way down the ramp, asking people to leave. Everyone was totally calm. No one was rushing into the gorilla habitat. 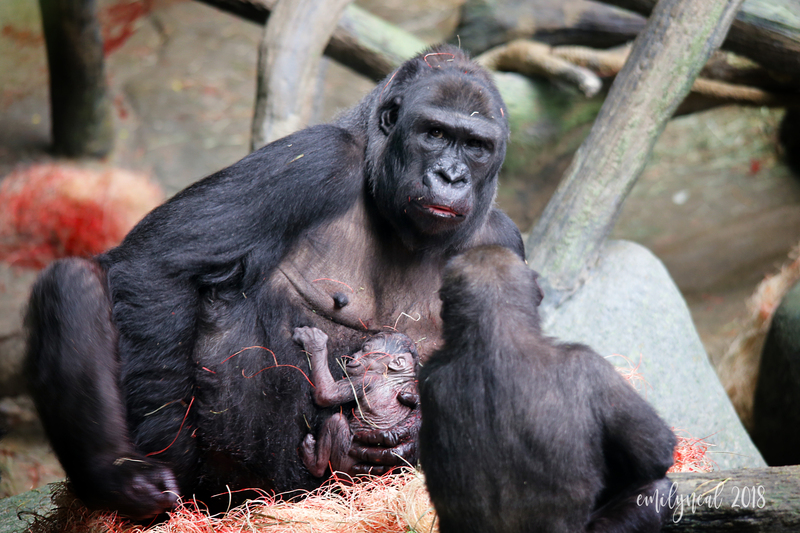 I asked the workers if they knew the gorilla was going to have a baby that day. They saw my camera and let me stay a few extra moments, snapping photos. 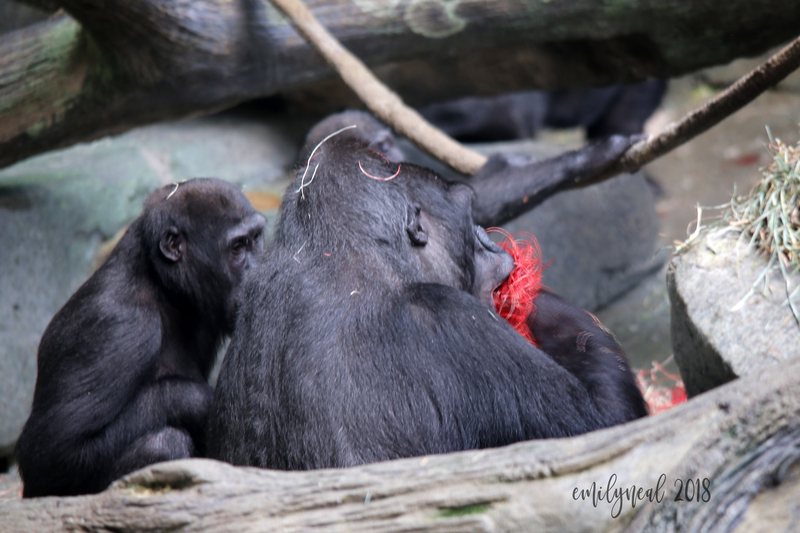 I was mentally beating myself up that I had lingered in the other room instead of walking into the gorilla area with my kids. But later, I realized that if I had been with them, I would have been asked to leave much sooner, and I wouldn’t have had the same awesome viewing spot that I did. I guess I always imagined that zoo animals would be taken into a sterile room to give birth and assisted by a veterinarian. It’s hard to remember that they are wild animals and want to give birth just as they would in the wild. The other moms around me all seemed to be just as emotional as I was that we had been able to witness such a special moment with that mother. A few years ago, I heard someone give a talk about “luck.” She said that luck isn’t just something random that happens to you. It’s a combination of being in the right Location with the right Understanding, Connections and Knowledge to make the best of the situation. That was definitely the case for me that day. My gut told me I would regret it if I didn’t lug that huge camera around all day. I walked into that room with my camera already set up on the monopod and ready to go. And I was blessed to find an open spot in a crowded room with a perfect view. All of that combined to give me a photography experience and a day at the zoo that I will always remember! This is the most awesome zoo adventure ever!!! I am still in awe!!! Thanks, Sues. It is definitely an adventure I won’t forget! Great photo series, thank you so much for sharing! I watched gorillas mating once (which was strangely weird as the female kept eye contact with me most of the time) but no birth. What a great experience. Not many zoo visitors are so privileged, and I’m glad you enjoyed it. I am so happy for you. It truly is an awesome experience. I witnessed Koola’s first born Kamba being born. Took almost 200 photos. 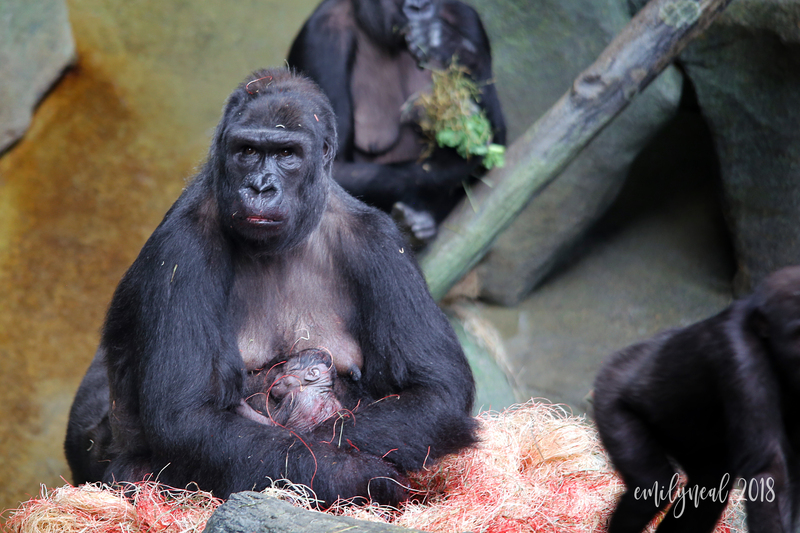 I was actually volunteering that day, and one of the other docents told me that Koola was in labor. I didn’t have my camera that day, so I ran home got to get it. 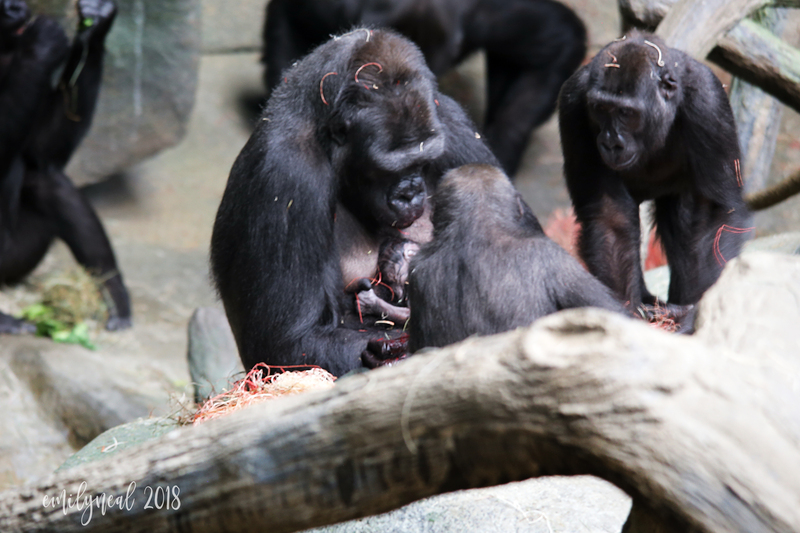 When Koola was in labor, Bana, one of the other gorilla’s was rubbing her back, almost like she was assisting in Lamaze class. Koola was very figidty but didn’t seem to make any noise. Next thing we know, there was baby Kamba. 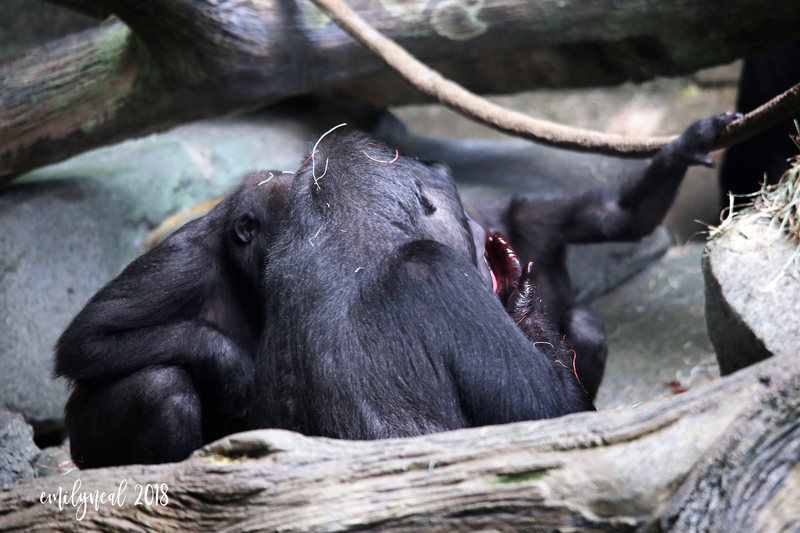 Koola slurped up the umbilical cord like spaghetti, and really looked like she was enjoying herself. It was quite an amazing experience. What time did this take place? I actually ran to the zoo for a bit on Friday, but didn’t go into TW because I knew it would be crowded. That’s an amazing story! I’m so bummed that I didn’t get there a few minutes earlier, but I guess my timing was just as it was supposed to be. My photos were taken at 2:17 p.m. on Friday. When I walked up to the viewing area she had just finished giving birth. So incredible, Emily!! Truly beautiful. Thanks, Jamie. It was such a gift to get that experience. Yes! That wasn’t just luck. That was “preparation meets opportunity”. I am in awe. Thanks, Sarah. It was such a cool experience.